Seriously cute 3 ring binders made from recycled cardboard. Available at Target. Wish I needed one. I especially love the feather print. I have to admit that browsing through catalogs, even lame ones, while on the throne is one of my guilty pleasures, so belonging to Catalog Choice is a small sacrifice on my part. But I can't stand to heft so much paper into the recycling bin, especially when all the information can be had online, and so I say no thank you to most catalogs. That's the beauty of Catalog Choice, you don't have to go cold turkey. If you can't live without the Ikea tome, you can still get it, but you can stop getting Bob's Fireplace Fixtures, and whatever other weird stuff clogs your mailbox. Our family is currently opting out of 54 different catalogs. In order to stop delivery of specific catalogs, you need to create an account at Catalog Choice and then, after you input the address info and customer number from each catalog you no longer want to receive, Catalog Choice will request that the companies no longer send you their catalogs. If you are receiving two copies of the catalog (one to you, one to your husband for example), you will need to request that they cancel both mailings. I wish you could just put in your address and be done with it, but the catalogs won't stop coming unless you input the specific addressee, so drag that pile of catalogs out of the bin and get to work. Once you have entered the variations of your name used by different companies, they will be saved to your account and accessible via drop-down menu should you need them again. This also works for some nonprofits (not all). I tend to get overwhelmed by the number of mailings I get from the Heifer International for example, especially when I know I'm only going to make one year end gift, so I save them money and resources by opting out of their mailings. The Food Project and Music! I am exceedingly proud to be on the board of trustees of a phenomenal Massachusetts' organization called The Food Project. I am especially looking forward to the evening of Saturday, March 13th when the Longwood Symphony Orchestra, composed primarily of Boston area medical professionals, is playing a concert to benefit The Food Project. The LSO's mission is "to perform concerts of musical diversity and excellence, while supporting health-related nonprofit organizations through public performances," and the March 13th concert promises to be marvelous. Featuring solo violinist Tai Murray, the program includes Debussy, Ginastera, and Barber. I'm no connoisseur of classical music, but my mother is and she took one look at the program, and declared it "wonderful!" BONUS: A Cleveland Orchestra performance of Debussy's La Mer is available for download on archive.org. As a board member who doesn't have a ton of money to give away, I am always looking for ways to use my time and talents to benefit the organization. To this end, I designed the four program pages allotted us, a poster for the lobby, and an information card (see first image) that we will use to collect people's mailing info and, hopefully, their donations. I am valiantly fighting the urge to buy the new Envirosax Origami Pouch. But, oh my, the designs are so pleasing to the eye, and wouldn't they make me a happier person, a better mom, etc. etc. It's not as though I don't already have close to 20 reusable grocery bags. But I swear, if I had these, I'd never want another one. As a mother, reusable grocery bag coveting has replaced my new clothes/new shoes wants. Companies that capitalize on that are clearly geniuses, and envirosax does it best in my opinion. Their product is strong, roomy, and aesthetically droolworthy. The only rub is that a pouch of 5 is almost $40. They are worth that, but it's hard to justify ponying that kind of cash up when everyone and their mother are selling 99 cent versions at the check out line. However, if you search online, you can almost always find sales and coupons for envirosax. For example, brightandbold.com offers free shipping and a 10% off coupon when you sign up for their enewsletter. If time is money, I do realize that the amount of time I spend searching for a piddling percent off negates the value of my savings, but I am a sucker for the hunt. Another fantastic product in the reusable bag market is the "snack bag" and you can find them in great number on etsy. Designs vary (I especially like the gusseted bottom version by greenstreetbags on etsy. They stand up and stay open, making it easier for little hands to snack). 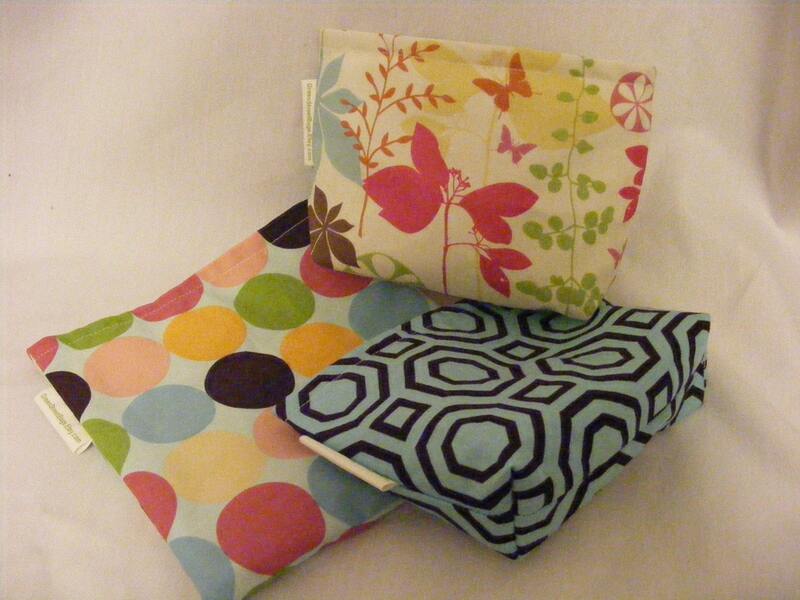 A search for "reusable snack bag" yields over three thousand hits in just about every fabric you can imagine. Most close with velcro and are lined with nylon, so even ooky foods can be ported. We have almost entirely phased out ziploc bags by using these, and they are much more fun to look at. Of course, like my grocery bags, I'm not happy with what I have and want MORE MORE MORE. Sigh. The bags are machine washable mesh, with a fun fabric top and a drawstring to keep your apples, zucchini, brinjaul, limes and whatnot from escaping. So ironic that an industry designed to reduce waste can inspire so much want.